It is most commonly due to aging but there are many other causes. Over time, yellow-brown pigment is deposited in the lens and this, together with disruption of the lens fibers, reduces the transmission of light and leads to visual problems. If your vision can be corrected to an acceptable level with a change in prescription, eyeglasses, including bifocals or contacts, may be prescribed, eliminating the need for surgery at that time. If your vision loss cannot be corrected with new glasses and cataracts interfere with your daily life, you may be a candidate for cataract surgery, which involves removing the clouded lens and replacing it with a clear, artificial one. Cataract surgery is usually conducted on an outpatient basis and is very successful in restoring vision. 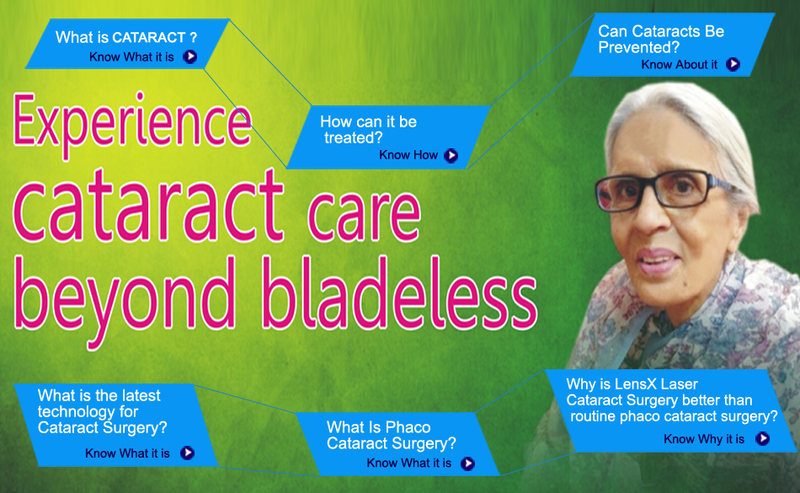 Because the exact cause of cataracts is uncertain, there is no proven method of preventing them. Because cataracts and other conditions such as glaucoma are common in older adults, it's important to have your eyes examined on a regular basis. This is particularly important if you have risk factors or a family history of eye problems. Adults should see an eye doctor at least every two years and annually after age 50. People with a history of eye problems or other medical conditions that increase the risk of eye disease -- such as diabetes -- may need eye exams more frequently. Be sure to ask your doctor if you have any risk factors or indications that cataracts or other conditions may affect your vision. The use of the femtosecond laser (FSL) in cataract surgery may represent the largest advancement in the field since the inception of phacoemulsification. The goal of this review is to outline the benefits of and barriers to this technology.There are several significant potential benefits of the FSL in cataract surgery over conventional manual cataract surgery: precise capsulotomy formation, clear corneal and limbal relaxing incision construction, lens fragmentation, and lens softening. Refractive benefits include more precise effective lens position as well as reduced effective phacoemulsification time with the use of FSL compared with manual surgery. Patients with conditions such as Fuchs' endothelial dystrophy, pseudoexfoliation, history of trauma, or brunescent cataracts particularly benefit from this technology. The new CENTURION® Vision System is the most advanced phacoemulsification (phaco) technology that optimizes every moment of the cataract surgical procedure. The new system automatically and continuously adapts to changing conditions within the eye, provides greater anterior chamber stability during each step of the surgery, and places optimized energy technology at the surgeon’s fingertips through enhanced fluidic management and surgical precision. The LuxOR™ LX3 with Q-VUE™ Ophthalmic Microscope is part of The Cataract Refractive Suite by a unique combination of technologies at the forefront of cataract refractive surgery. The VERION™ Image Guided System is designed to add greater accuracy and efficiency during surgical planning and execution. Consisting of the VERION™ Reference Unit and the VERION™ Digital Marker, it enhances the way one performs cataract surgery. Phacoemulsification refers to modern cataract surgery in which the eye's internal lens is emulsified with an ultrasonic handpiece and aspirated from the eye. Aspirated fluids are replaced with irrigation of balanced salt solution, thus maintaining the anterior chamber, as well as cooling the handpiece. Laser outcomes surpass manual outcomes. Clinical evidence supporting the supposition that femtosecond laser-assisted cataract surgery will actually produce better outcomes than manual cataract surgery has been proved. Here, three surgeons at Kashyap Memorial Eye Hospital share their reasons for believing that femtosecond cataract surgery produces better results than manual surgery, thanks to more accurate astigmatic arcuate incisions; a more “perfect” capsulorhexis; being able to soften the nucleus; creating fewer complications; increasing efficiency. Femtosecond laser cataract surgery offers a dramatic improvement in surgeons’ ability to make both consistent cataract wounds and extremely accurate astigmatic arcuate incisions. “The incisions a surgeon makes with the laser is much more precisely placed on the cornea and repeatable than can possibly be made manually using a diamond knife, “Both cataract incisions and arcuate keratotomy incisions are going to be substantially more precise. One can’t make an arcuate incision at exactly 43 degrees, exactly 80 percent of the measured depth of the cornea and exactly 46 degrees in arc width, using a diamond knife. About 80 percent of cataract surgeons are not comfortable making arcuate incisions in the cornea to correct astigmatism. That’s why the arcuate incision has never become the predominant method for correcting astigmatism, and the toric lens has increased much more rapidly than arcuate keratotomy. But that’s going to change, because the cataract surgeon won’t have to make that precise incision himself. A nomogram in the laser will determine where to put it, and how wide and deep to make it. The surgeon just has to press a button. Capsulorhexis is more regular, or more circular, and it’s placed exactly where we want it to be, then it’s possible that we’ll get a more consistent centration and positioning of the IOL. For example, a symmetrically circular capsulorhexis makes difference in the lateral position, in terms of centration, which in turn can have a small effect on the IOL power calculation. A more circular capsulorhexis has an effect on posterior capsular opacification. “Ideally we want the rhexis to cover the outer quarter- or half-millimeter of the lens, and we want it to overlap the lens all the way around, uniformly,Studies have shown that two things help to reduce PCO. First, a sharp posterior IOL edge pushed against the posterior capsule helps prevent epithelial cells from getting under the lens onto the posterior capsule. Second, a consistent overlap by the anterior capsule sequesters the epithelial cells into the little peripheral chamber that’s created along the edge of the lens, and they can’t get out. There’s a much better chance that one can get that perfect overlap with the femtosecond laser than manually. Femtosecond laser’s ability to facilitate the division of the nucleus is most impressive. We’ve tried different approaches with this part of the procedure. This potentially affects refractive outcomes as well. “The other thing that manipulation inside the eye does is stress the zonule, People have theorized that it’s a more consistent capsulorhexis that gives you a more consistent effective lens position, but the tautness of the zonule is what determines the position of the IOL. So to the extent that we don’t stress the zonule, likelihood of ending up with a more predictable ELP is much more. It has better refractive outcomes.